Category: hair bands, hair bands. Warm reminder: feathers are all kinds of wild birds who are natural products, not the machine to do it, the size varies. 100% New and good quality! color: white. With a wide range, good quality, reasonable prices and stylish designs. We will try our best to solve the problem for you. Products without any quality?. We will be glad to reply and help you to solve any problem. Very sparkly headband with crystals and beads. Gorgeous and Glamorous Bridal Hair Band. You will look charming wearing it with dishevelled hair, look elegant wearing with hair arranged, better effect with veil. 1920's GATSBY Deco Flapper crystal rhinestones Jewel Headband. 1920's Flapper Headband. 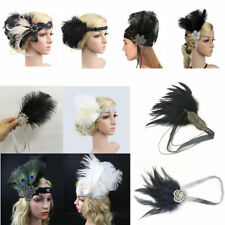 This is the perfect accessory for a 1920s fancy dress party, ball/prom or wedding. Otherwise I shall send you the average size of 56-58cm. 1x Feather Headband. Material:Feather, Crystal Rhinestone, Beads,Elastic Ribbon. Feather Width: approx.1 5-20 cm. You can wear this on top of the hair - low on the forehead or more up on the hair line or you can wear it underneath the hair as an ordinary hair band. DIAMANTE DROP HEAD BAND. ADDS A TOUCH OF GLAMOUR TO ANY OUTFIT. WITH ELASTIC AT BACK SO ONE SIZE FITS ALL. 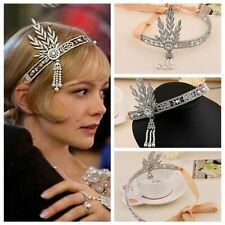 1920's Great Gatsby inspired headband. Similar to the style worn by the character Daisy from the movie. Beautiful and sparkly with lots of diamanté crystals and set on an elastic band at the back for comfort. Perfect for a wedding or theme night. FAST POSTAGE!! Usually always Faster than the delivery date stated !! I specialise in 1920s and bridal hair accessories so if you liked this, please take a look at my other listings. ADJUSTABLE CLASP FASTENING AT THE BACK. STUNNING BRIDAL HEAD PIECE. ADDS A TOUCH OF MUST GLAMOUR TI YOUR LOOK. MUST HAVE LOOK VERYKIM KARDASHIAN INSPIRED PIECE.